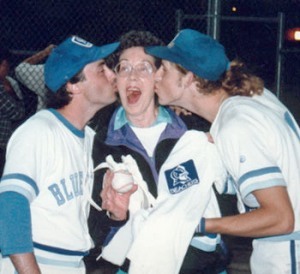 SABL founder Tom Howley (left) and Matt Lister (right) kiss super fan Aunt Dee after the Blue Devils won the championship in 1992. In 1985, after years of playing semi-organized pick up games of baseball, Tom Howley decided to create an official league to accommodate the growing number of players 19 years or older looking to play baseball. After addressing some logistical issues around insurance (initially, they thought the City of Toronto might make them use a rubber ball), the SABL (originally called the Scarborough Adult Recreational Baseball League or SARBL) began its inaugural season in 1985 with 4 teams. In that first season the cost was $50 a player and it included uniforms. The uniforms consisted of white shirts with sleeves of the colour of your team (i.e. Red, Blue, Green, and Yellow). Interesting to note that one of the original 4 teams was the Blue Devils which in turn became the Reds in 1995, and then the Redbirds in 1998 and is still in the league today. Eventually the league expanded from 4 to 6 teams, then to 8 teams and then to 12 in 2001-2002. In 2003, the league contracted back to its current 10 team configuration league which is broken into two, 5 team divisions. One of the divisions is named after the league's founder Tom Howley and the other division is named after Kevin Sherrard, a junk ball pitcher of limited talent that personified the type of player in the SABL. Tom Howley retired as a player with the Redbirds after the 1998 season and then he retired as commissioner of the league in 2001 after 17 years at the helm. Matt Lister took over as commissioner in 2002 and helped the SABL transition to the league it is today, by changing the name from SARBL to SABL and to affiliate the league with the Scarborough Baseball Association. As well, the SABL moved its main park to Wishing Well from Highview Park where it had played its first games back in 1985. Matt step down as commissioner in 2005 and the SABL is now run by a 3 man executive of Mike Dymond, Rick Lam and Anthony Schiralli.